Apr 6th, 2018 to Apr 22nd, 2018. Tor Straße tram lines on a sunny but cool day in Berlin. I’m always amazed how light the city centre traffic is in Berlin, even in the middle of a workday. It has to be because of the great public transport and the heavy use of bicycles. 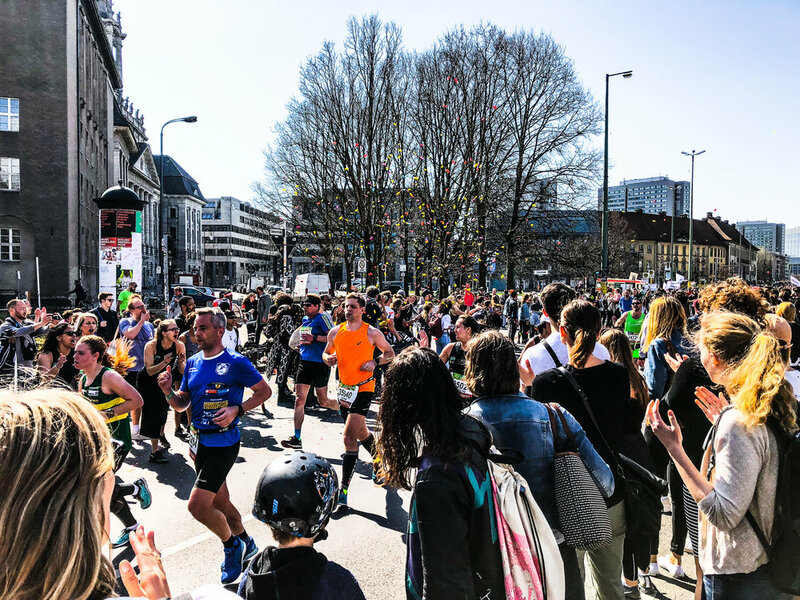 with the race led by roller-bladers, cheered on by several drum bands, a cheerleading team, a rapping DJ and clapping crowds lined along the route as the pounding drums in sync with the pounding feet urged the runners on to the finish line. 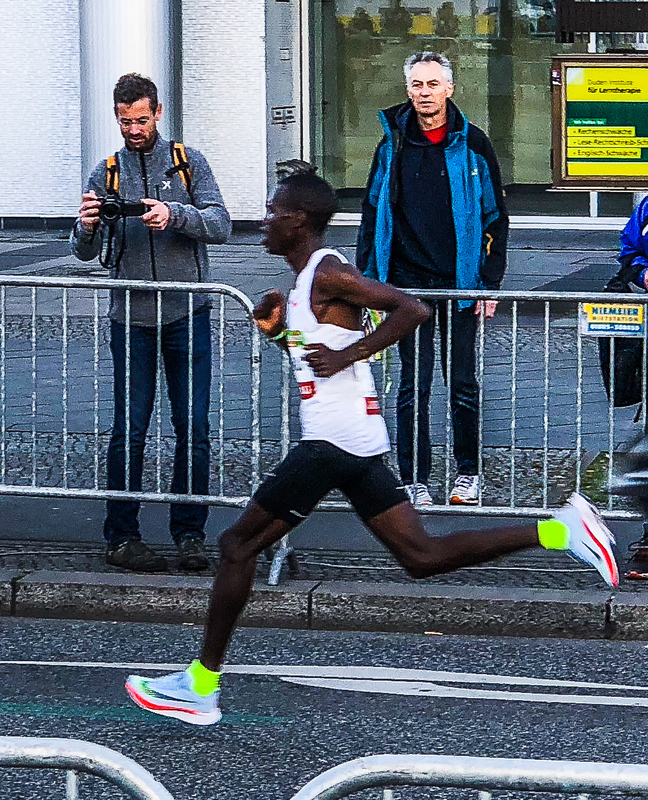 It was won in 58 minutes by Kenyan, Erick Kiptanui and in fact, the first seven or eight runners in the race were Kenyans leading the field of more than 36,000. Erick Kiptanui, the winning runner. 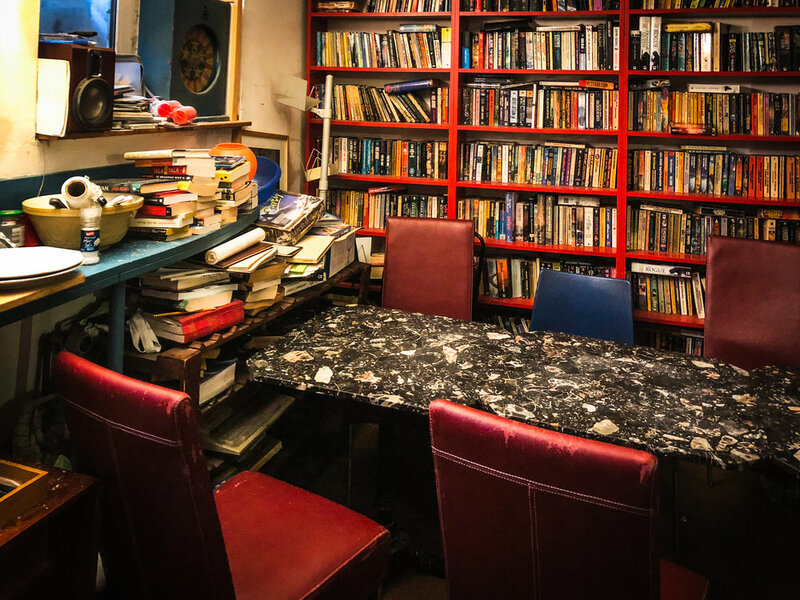 I was at two writers' meet-ups today and the second one was in the evening in the basement of a quirky little bookshop called Another Country. I based the bookshop in my second book on this higglety-pigglety little shop. As I was too early I spent my time photographing the street scenes in Kreuzberg, showing people on their way home after work. Queuing for ice-cream (well worth the wait) and a Mobile art gallery converted from an ice-cream van. 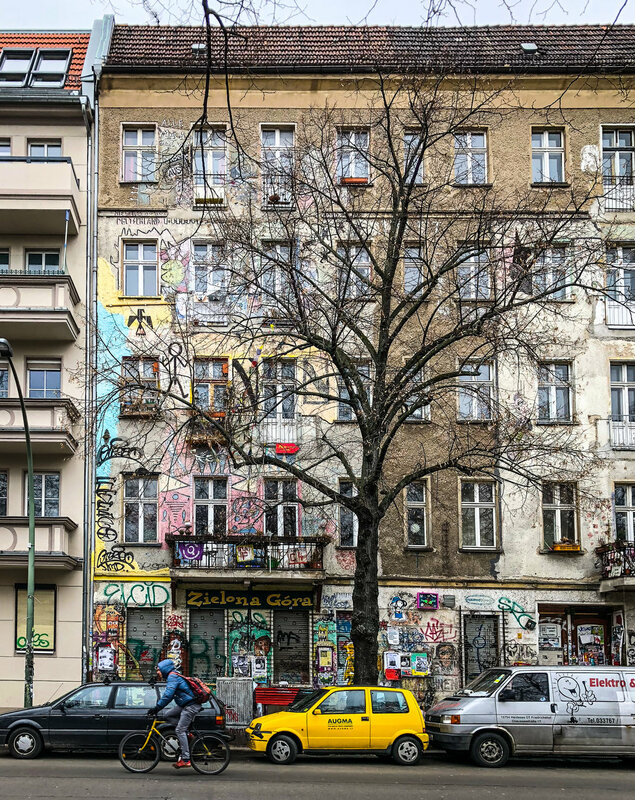 I pass this mural regularly as I cycle to Milch&Zucker cafe in Kreuzberg to do a little writing. The same street artist has done murals in Brick Lane in London. 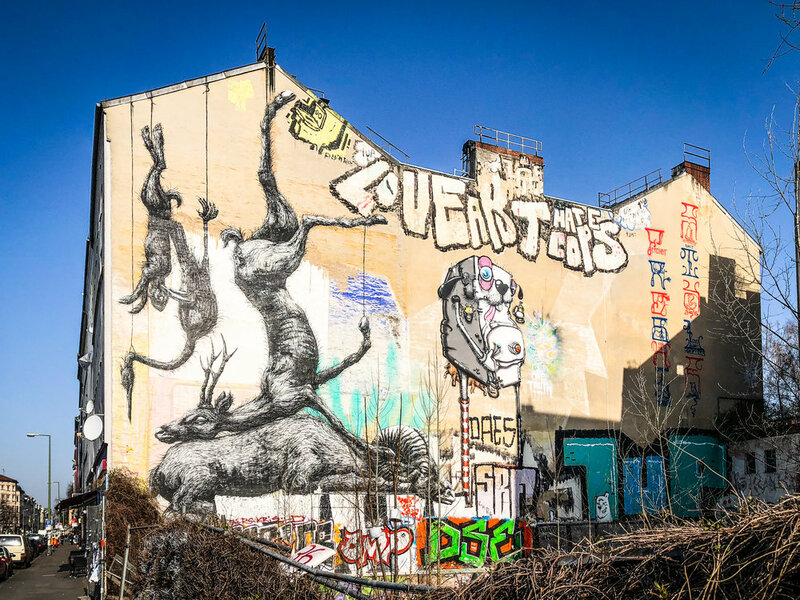 As far as I know, it's by Belgian artist ROA and the third image is one of his murals in London. 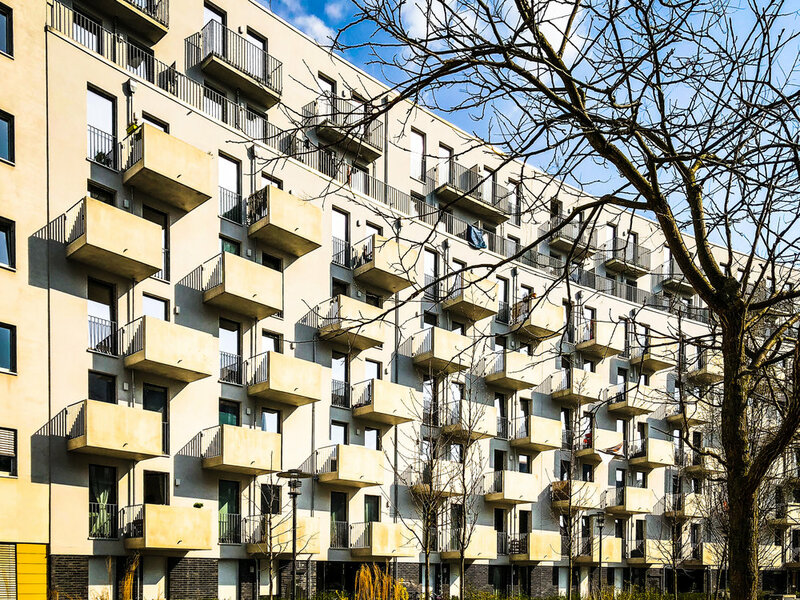 Something about the regularity of the form and the shadows under the balconies attracted me to photograph this apartment block off Rudi-Dutschke-Straße. 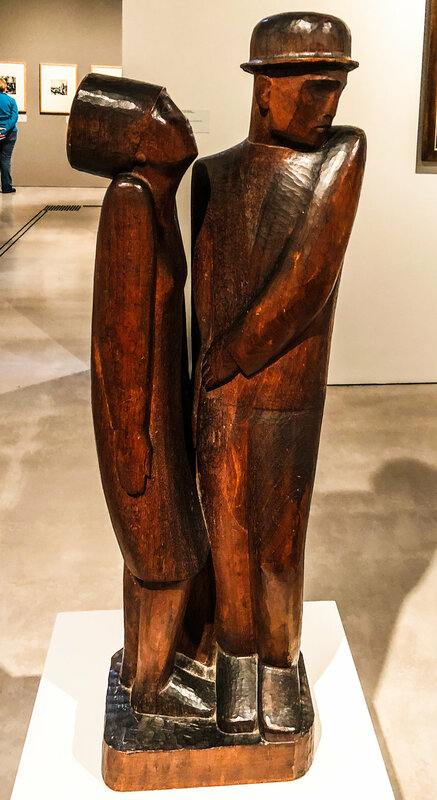 Painting of Berlin street life, a wooden sculpture by Hermann Nomenmacher and a painting by Margarete Kubicka from the Berlinische Galerie permanent collection. Waiting for the RB-14 Airport Express at Ostbahnhof Station this morning, as I'm going back to Dublin for 5 days. April 12th, 2018 to April 16th, 2018. I came back to Ireland for a few days to celebrate Kieran's 30th birthday. Click the image below for more photos of the party. Back in Berlin again today after my 5-day trip back to Ireland. It's around 20c or more here all week and beautiful weather to cycle around the city. Four more photos of the city today and all connected with the Overbaum bridge. 1. Evening light as people walk across the bridge. 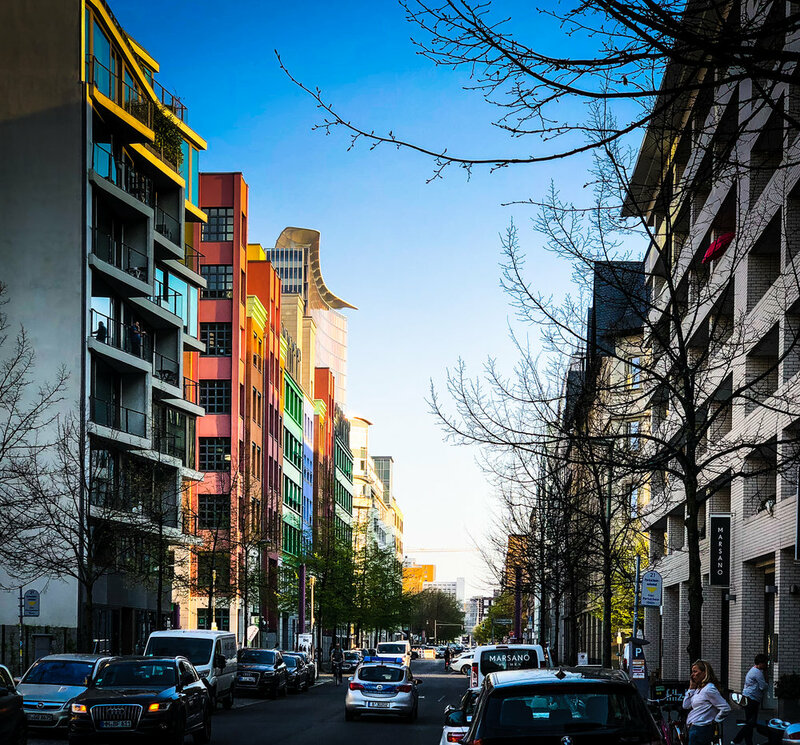 Evening sunlight on the coloured buildings on Charlottenstraße close to the Mindspace building where I went to a Python Data science meet-up this evening, and the crescent moon over the buildings as I left. After the writers’ meet-up today I went to a Microsoft Azure technical meet-up as it’s good to occasionally keep up with technology while I’m here for 5 months. 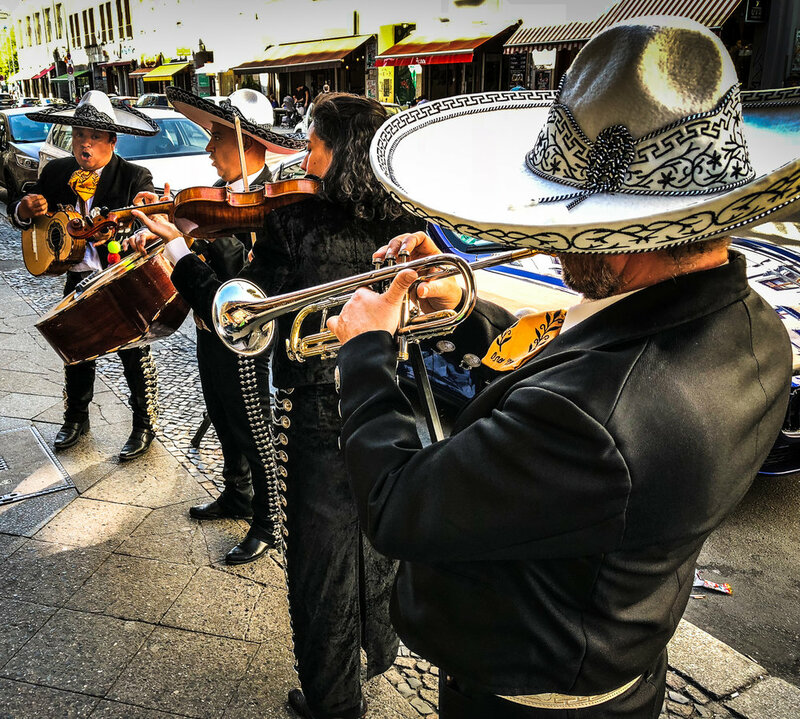 On the way back I cycled in the glorious sunshine through Kreuzberg on my way home to Friedrichshain, and I passed this Mexican group performing outside a Mexican restaurant. I’ve been making good progress on the first draft of my book and have written just over 300 pages (75,000 words) with about 40 pages to go, to finish the draft. However, I ran into a problem with an assumption about the German political system and in order to fix it, I had to move some scenes back to September 2017 to the German federal election date. I’m trying to be politically correct :) But this change caused quite a number of knock-on effects to the story and it has taken four or five days to correct it. I should have done better research at the start and in the end, I got the information I needed from a German writer at the writers’ meet-up. Volkspark, Friedrichshain on a sunny Sunday afternoon and thousands of people came out. Kids playing frisbee and football, the smell of barbeques and the wisps of blue smoke from them, tents, bikes, sunbathers, families, party time, cold drinks, beer, lots of food and the long, long queues for ice cream. A lot's happened over the last 10 days, including Easter which has two public holidays in Germany (Good Friday and Easter Monday). Even holy Ireland doesn't have Good Friday as a public holiday. 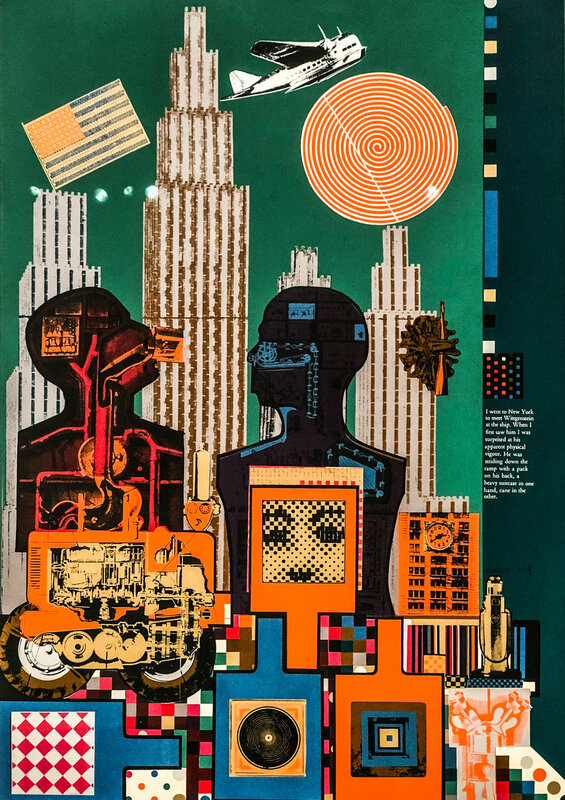 I was at the Berlinische Galerie and the most outstanding exhibition was Eduardo Paolozzi who’s work included illustrations, paintings, collages and sculptures all with strong bold colours and shapes. Good Friday morning and most people here in Berlin are in bed as it's a public holiday. 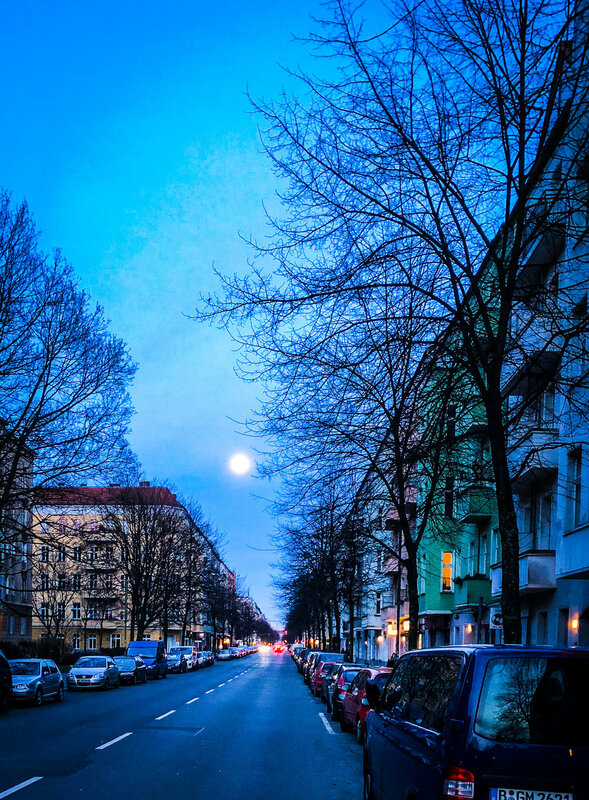 Full moon over Friedrichshain on Easter Sunday. Waiting for the night tram on WarshauerStraße on the way to Friedrichshain cinema which shows films with the original language (mostly English) and German subtitles. I went to Black Panther which is another movie based on Marvel's superhero comic book source. Its the first film I’ve seen with an all-black cast with a token white actor - interesting reversal. It’s based in a fictitious country in Africa and the story line has a mix of African culture and space age technology. Girl making giant bubbles at Hackescher Markt. Now that the weather has improved here in Berlin, I bought a second-hand bike in a bike shop in Prenzlauer Berg for €200. The guy in the shop said he’d buy it back again in 4 months time when I’m leaving.It’s kind of an old-fashioned bike but well maintained and there are so many old bikes here so it doesn’t look out of place. It’s perfect for what I need, to cycle around town. 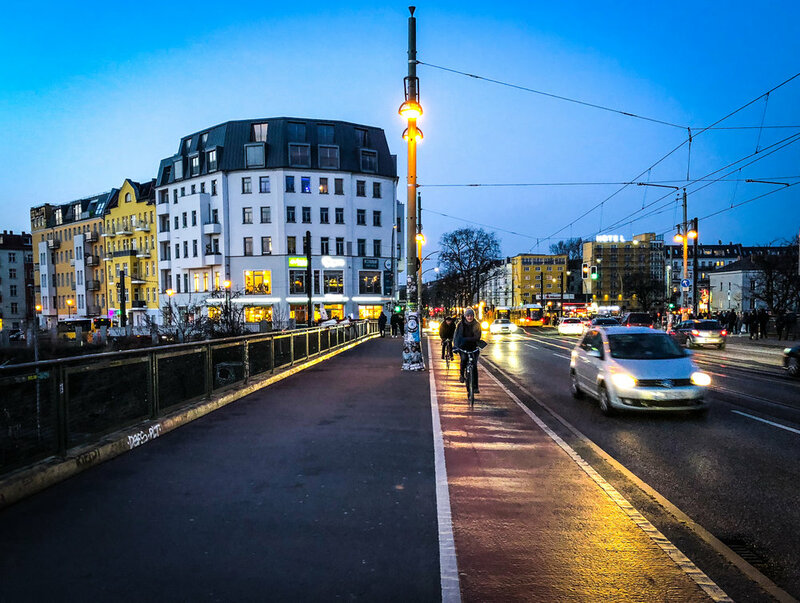 It’s about a 20-minute cycle from my apartment in Friedrichshain to the cafes on Tor straße and Bernauer straße where I go to the writers’ meet-ups. And of course, as I cycle around I can stop and take photos of interesting buildings, like this church on Denziger straße, and the building on Peterburger Platz. I passed both these buildings many times on the tram but I never got photos until today when I was cycling. 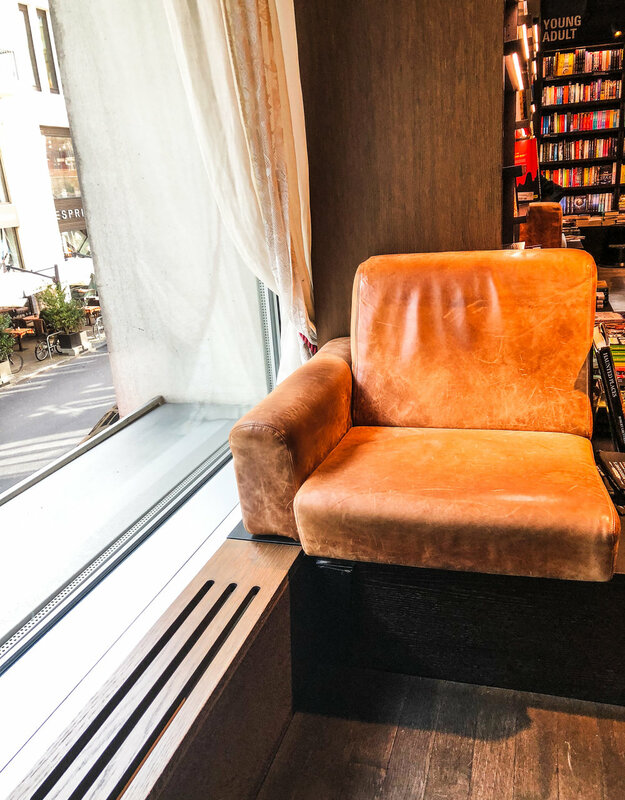 I did some writing today in Milch & Zucker Cafe which is a co-working cafe where lots of people bring their laptops buy coffee and food, and work there for a few hours. It's got lots of power outlets and fast Wifi, perfect for mobile workers. Today I after the writers’ meet-up I cycled down to Friedrichstraße to go to Dussmann which is by far the best bookshop in Berlin. It’s not only the three floors of books, music, films and the two floors of the English bookshop contained inside, it’s the views of the atrium, and the comfortable leather window seats allowing you to read a book glancing occasionally out the window across the street at beautiful buildings or looking at the view down Friedrichstraße with the busy street and trams and the S-Bahn beyond, but inside is the quietness of a library. And on the way out there were two accordion players playing Vivaldi and I was surprised how versatile the accordions were. Jugglers at the traffic lights at Alexanderplatz. When the lights turn red they juggle for a minute and then hope to get tips from drivers. They didn’t make much money but it was fun to watch especially when their skittles were still in the air when the lights turned to green. 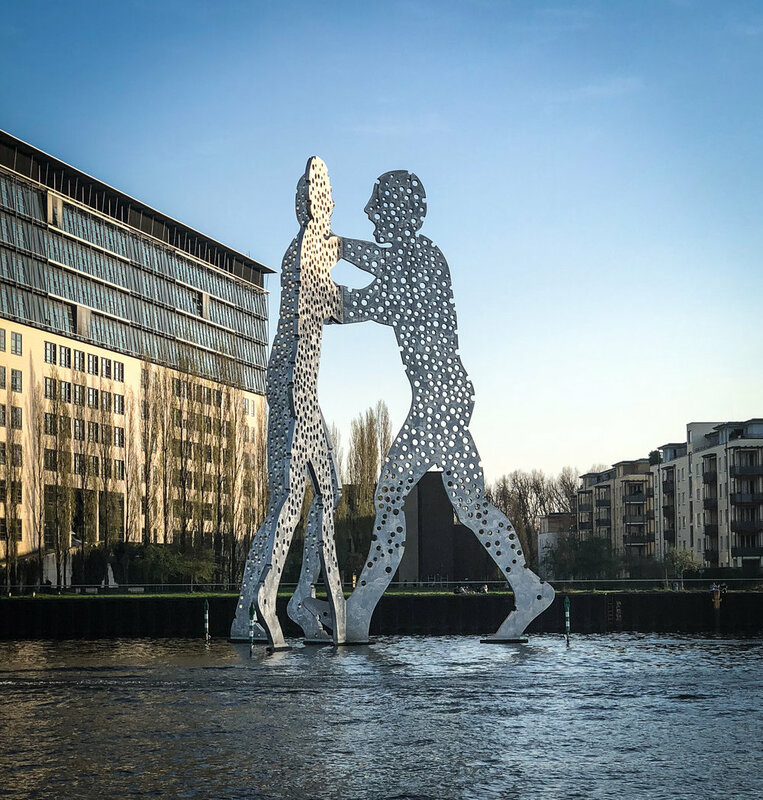 It's a little over 4 weeks since I arrived in Berlin for this year's writing trip and I've written about 52000 words (about 210 pages) of the first draft of the new novel so I expect I'll get the first draft finished around the end of April or early May. I find the only way to make good progress is to write every day and make sure I write at least 1500 words (6 pages) before I do anything else. Once that's done, I'm free to research, or draw or take some photos or read or visit a gallery or cycle around the city and meet my friends. It's a great city and so easy to live here. I passed this statue of St George slaying the dragon at Nikolaivietel near Alexanderplatz on my way to the Berlin State Library this afternoon, which is yet another free place to work in the city. Beauty in the eye of the beholder. 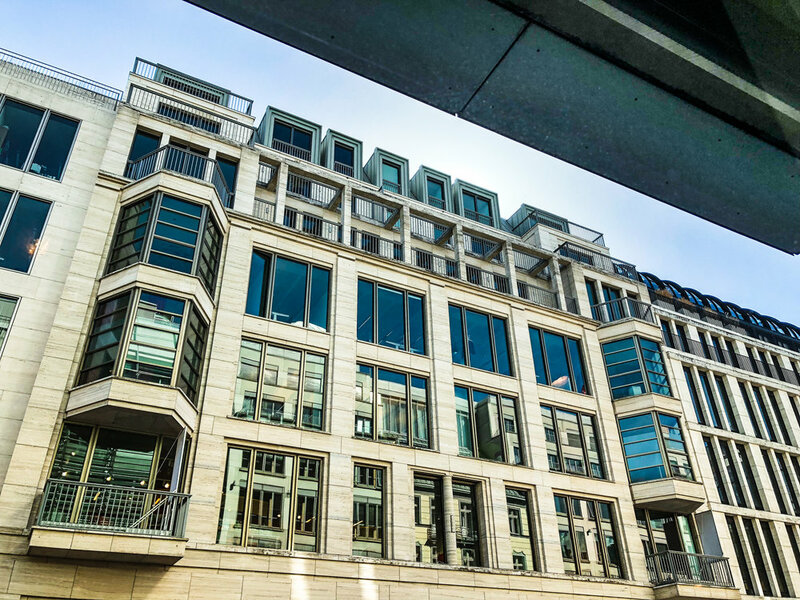 Although Berlin is not a beautiful city like Paris or London, there are lots interesting and beautiful individual buildings and lovely architectural details which I see every day as I’m walking around. So it may not be classically beautiful on a macro scale but it does have a certain beauty and charm on a micro scale, in the individual buildings. ▪ S-Bahn train arriving at dusk with a backdrop of the city and TV tower. ▪ Wasserturm and tower, at Prenslauer Berg. Berlin’s oldest water tower built in 1877. These Grill Runners are everywhere in Berlin, out in all weather, with a little gas cooker on their backs and a bratwurst sausage fryer at the front, cooking German hot dogs: Bratwurst sausage in a bread roll with tomato or mustard sauce. I've just finished week 3 of the writing trip and I also passed 41,000 words (170 pages) of the first draft of the new book, which is about the half-way point in this draft. Of course, I'm well aware that finishing the first draft, which I hope to do in about four or five weeks time, is only one of many milestones in completing the novel. Sunday 11th March 2018 and it's 17 centigrade and sunny in Berlin. Spring has arrived and everyone was out enjoying the sunshine at Museum Island. Amazing change considering it was below zero here last week. 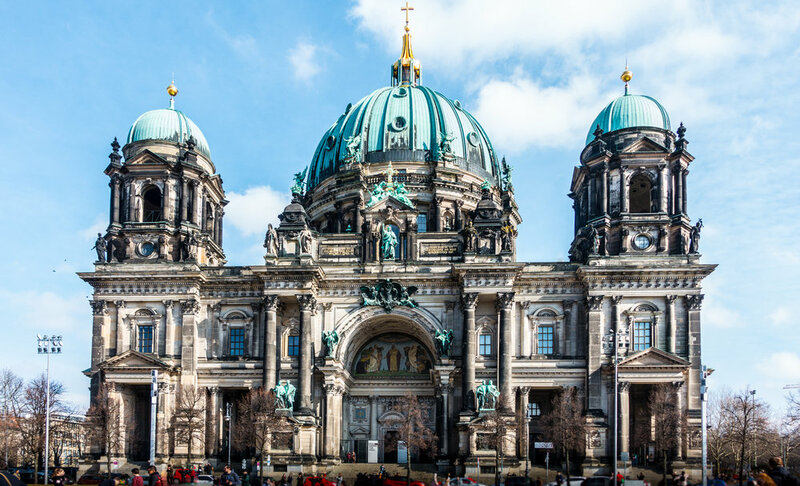 Berlin Cathedral (Berliner Dom) built in 1905 in a neoclassical style and it looks older than it is. Alte Museum - built in 1830 to house the Prussian Royal family’s art collection. Alte Nationalgalerie - houses neoclassical and romantic art and also impressionists and some modernists works. Humboldt University - established in 1810 it is the oldest of Berlin’s 4 universities. Yesterday, it was a balmy 17c with sunshine and I optimistically thought spring had come, but today I was brought back down to earth with 9c and raining. This is probably a more representative March day for Berlin. I'm constantly on the lookout for photo opportunities as I travel around Berlin. Busker at the U-Bahn this evening. 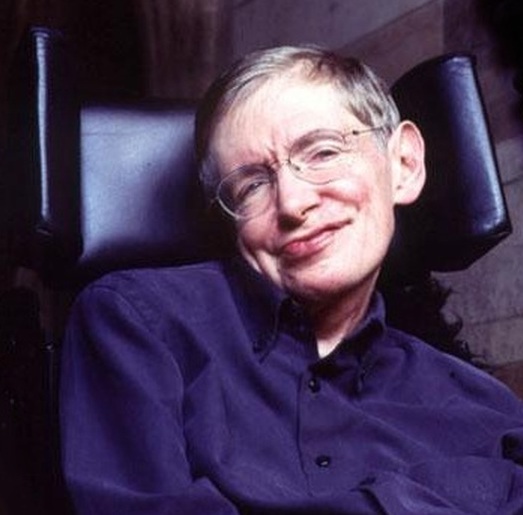 "Of course, they say every atom in our bodies was once part of a star. Maybe I'm not leaving... maybe I'm going home." 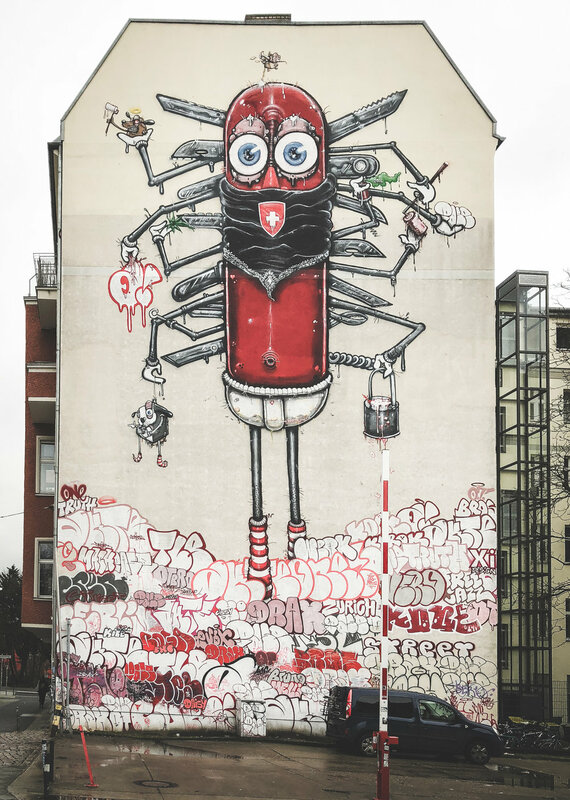 The street artists never pass up a good opportunity to paint a mural, particularly on the sidewalls of apartment blocks. Today I went to Betahaus cafe, close to Moritzplatz in Kreuzberg, to do some writing. This cafe is full of developers, writers, people from startup companies and others who use it as a co-working space - lots of bench tables with many plug points and free WIFI and of course, the cafe has excellent coffee to fuel the working day. Nearby was yet another side of apartment mural. Later I went Modulor which is a huge art materials supermarket, to buy a sketch pad and some pencils, as I plan to do some drawings while I’m here. On the way back home on the U1 U-Bahn there was a woman laughing hysterically. At first, people just looked around to see who was laughing and why. After a few stops a lot of people were smiling and by the time I got off, quite a few, including myself were laughing - surprisingly infectious. 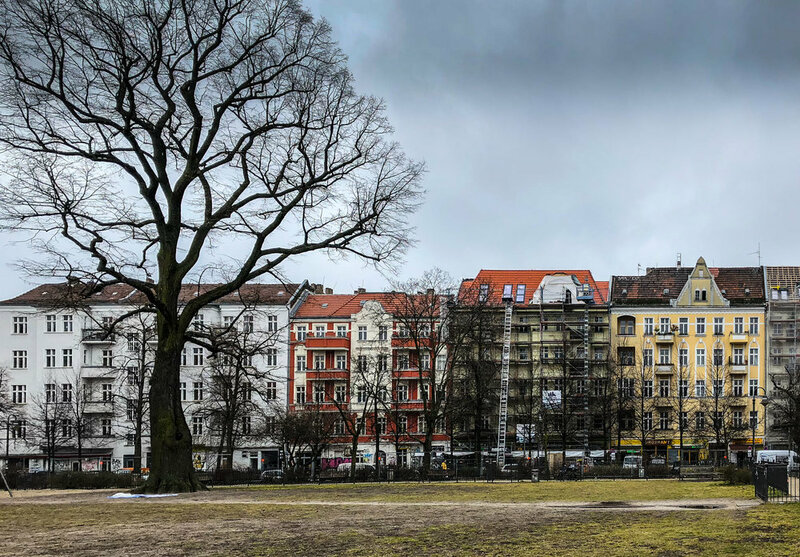 Berlin has more than 2500 public parks, many of them in small squares like this one at Boxhagener Platz, but there are also some very big parks like Tiergarten and Tempelhofer Feld and about one-fifth of the city is in trees and parkland. I visited the Neue Wache (guardhouse) a few days ago. It is the central memorial for victims of war and is situated on Unter den Linden. Inside is a single sculpture by Kollwitz showing a mother and her dead son (a bit like the famous Pieta). There’s a certain solemn stillness inside which feels like being a church as it is in total darkness except for the single shaft of daylight radiating from the open circular oculus in the roof above the statue. I felt transported to another place and time for a few moments and then I was back out into the light and hustle bustle of the city outside. I was at the theatre on Friday night to see a production of “Robar El Dia” (Steal the Day) It was a Spanish production with English and German sub-titles (on different nights) projected above the stage. It was written and directed by Alfredo Felix-Diaz who attends the writing meet-up group which I go to several times a week. It's a drama set at the end of the first work war and it was an excellent production staged in The Delphi which is one of Berlin's few remaining silent movie houses from the 1920s repurposed as a theatre, complete with the traditional bar and people sitting around tables watching the performance. March 17th, 2018 - St Patrick's Day. Although rugby is not a huge interest of mine, I'm delighted to see Ireland win the Grand Slam today on St Patrick's Day 2018. It was -5c here in Berlin today and hundreds of people turned out in the cold to celebrate the day and watch the matches (there were others, but only one really mattered). Sunday 18th March was a cold -4c in the morning with a wind-chill factor of -9c. (amazing that it was 21 degrees warmer last Sunday) But it was also blue sky and blazing sunshine and outside it felt a bit like being a ski resort. I went to visit the Stasi Museum in Lichtenberg which is about 4 Km from my apartment and took about 45 minutes to walk there. It was well worth the journey and inside the main Ministry for State Security building, there were three floors open to the public, describing the history of the GDR from 1949 to 1989 and work of the Stasi in trying to mould the East German population into the Soviet model despite their resistance. The place is filled with pictures, videos artefacts of spying and texts showing the history of oppression, surveillance, imprisonment and eventual liberation after the fall of the Wall in 1989 and the subsequent reunification of Germany a year later. 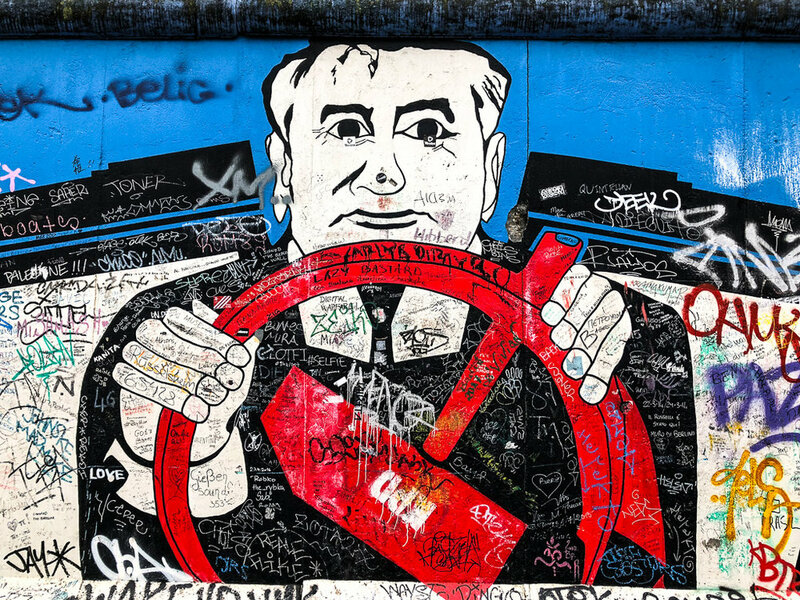 It’s a fascinating period of history for Germany and so recent, only thirty years ago. Stasi spy equipment - hidden camera in a domestic radio. Another week has passed and I've been writing most days (1500 to 2000 words per day) and I've now written 30,000 words (120 pages) of the first draft of my new novel. 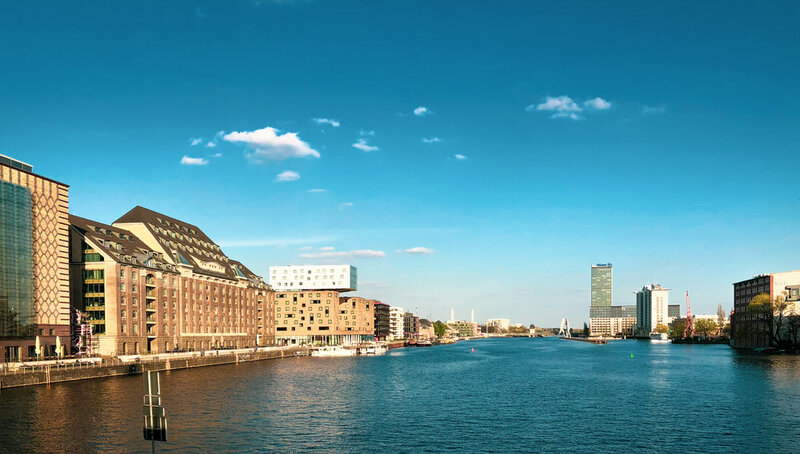 My time has been filled with, the writer's meet-ups 4 times per week (great motivation), meeting my Berlin friends, other tech meet-ups, writing my blogs, visiting museums and taking architecture street photographs. On previous writing trip, I've posted a blog entry most days and occasionally posted on Facebook. This year I'm reversing that process, so I'm posting on Facebook most days and then every five or six days I'll gather all Facebook posts into one larger blog post with lots of photos and post it here to a wider audience. I like to travel light, so this is all I'm taking with me for my 5-month trip: 1 carry on duffel bag for clothes and a small backpack for MacBook, iPad, Sony Camera and some chargers. It's surprising how little you really need. I was supposed to fly into Berlin on 1st March but due to a snow storm in Ireland, my flight was cancelled and the next flight I could arrange was on Monday 4th March. So I flew into Berlin on last Monday evening. This time I'm staying on the East side of Berlin in Friedrichshain. I know this area has a name as being party central (and I'm not really a party guy) but the apartment is in a quiet enclave but with lots of restaurants and (clubs) close by. I'm staying about 5-minutes from Warshauer Straße Station and it's good for train shots: This was on a cool crisp bright morning. 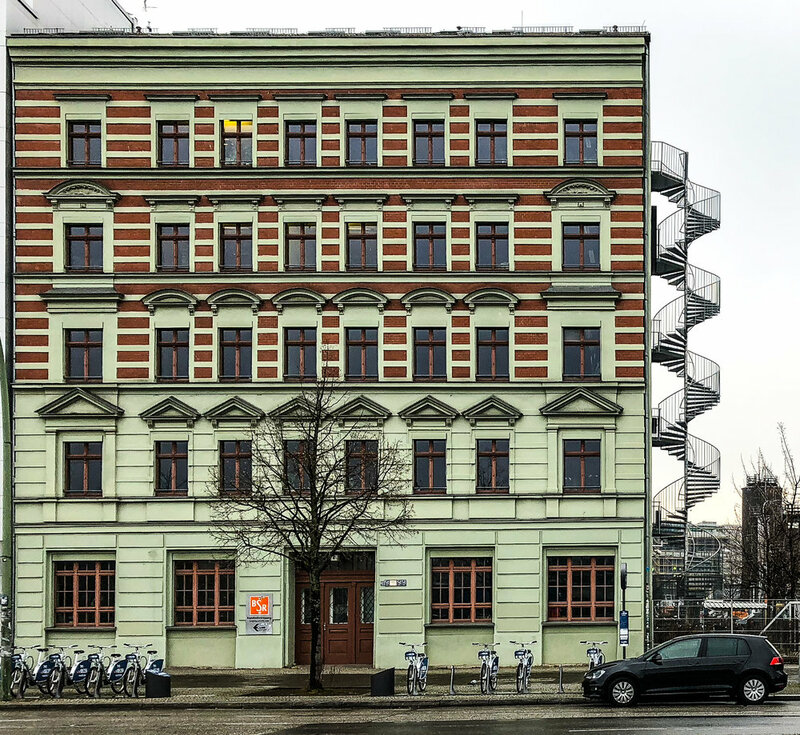 One of the things I like about Berlin is the grunginess of it and you certainly get that at Warshauer Straße. "Into the Light". Exiting Warshauer Straße S-Bahn station, construction tunnel into the light of the streets. I like to walk around the city taking shots of people, buildings, objects, anything of interest. This trip I'm mostly using my iPhone X as the camera and the ProCamera app, both are excellent. Of course, I also have my trusty Sony RX 100 III which is a super high-quality compact camera in my backpack. It's small, light but perfectly formed - I prefer it to my Sony A7 full frame camera because I always have it with me, whereas I only occasionally bring the A7 as it's bigger and heavier. Vintage camper at Boxhagener Platz park. Two painted mannequins in the window of a quirky little cafe called “Weinerei” where I had lunch today with some of the people from the Writer’s Meet-up. I was at my first Writer’s Meet-up today on this new writing trip to Berlin where I’m writing the third book in my crime/spy trilogy. Writers from Germany, Poland, USA, UK and Ireland joined the meeting where we wrote for about 90 minutes. As I was well prepared, I wrote about 3000 words (12 pages) today, which is twice my daily target of 1500 words. It was great to catch up with my friends who I met here last year when I was writing Book 2. I’ll be going to the meet-ups three times a week for the next few months. One of the countless alleyways in Berlin which are covered in posters, murals, and graffiti tagging. 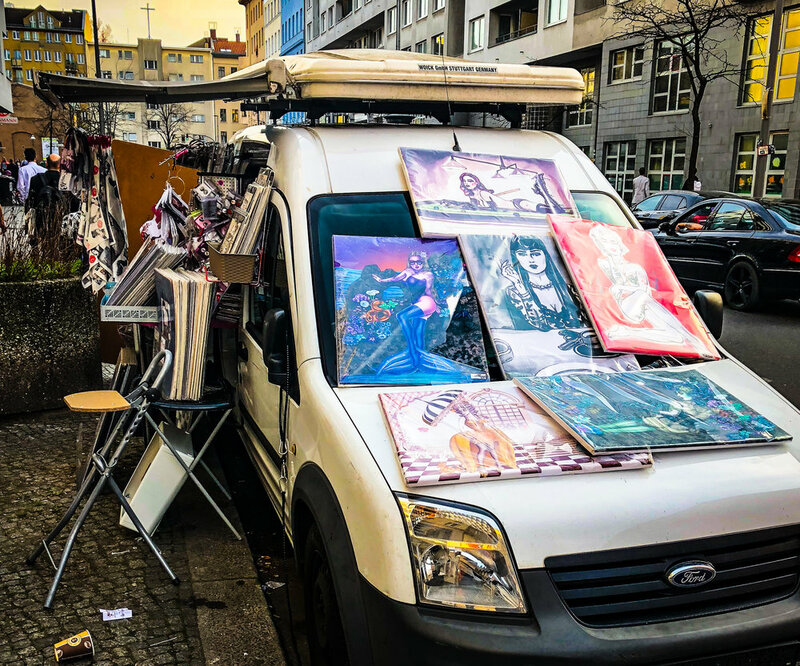 It feels like there is a vast population in Berlin which wants to communicate by public images, despite the fact that it is illegal and punishable by fines of more than €7000. The murals are great but I’m not hot on the senseless graffiti tagging. On my way back to my apartment yesterday evening I took a detour along the East Side Gallery, the stretch of about a mile of the Wall which is painted with murals. Many of them have been repainted recently as they had been covered in years of tagging. 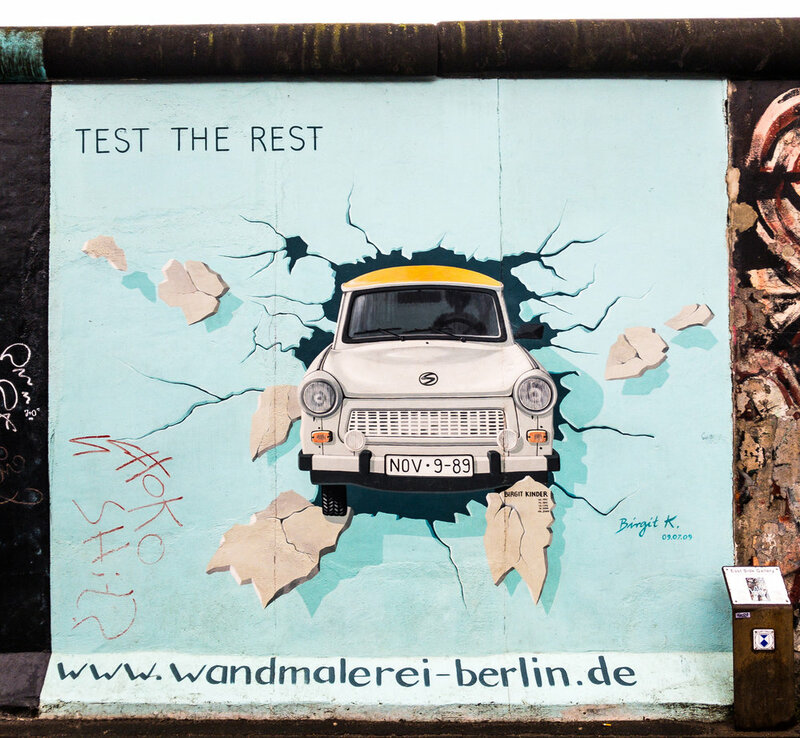 More images from the Berlin Wall East Side Gallery: A car breaking through the wall and a locked gate giving a view of the Spree river at the other side of the wall. In summary, things are going well here and I wrote about 50 pages (12000 words) of the new book this week, and I'm also getting to do a bit of street photography. It's the last day of my 4-month trip to Berlin before I fly home to Dublin. I'm not sure "trip" is the right word as after the first few weeks I settled into living here in Berlin and working on this writing project, so a 4-month project is probably more correct. For the first 9 weeks, I concentrated on writing every day, about 1500 words (6 pages) a day, mostly 7 days a week. This usually took about 2 - 3 hours a day as I was prepared every day and knew what I was going to write. After 9 weeks I had the first draft completed (98,000 words, 380 pages). I also took a lot of photos and created about 20 paintings and drawings. I settled into visiting museums and galleries once or twice a week, rather than every day as I did in the first two weeks. The writing meet-ups were of great value to me and I went to them 3 times a week and made a few friends there, and it motivated me to hear what others were writing- short stories, essays, novels, film scripts, graphic novel scripts and poetry. Sometimes I went to other meet-ups - drawing, photography, technology, graphic arts and social. 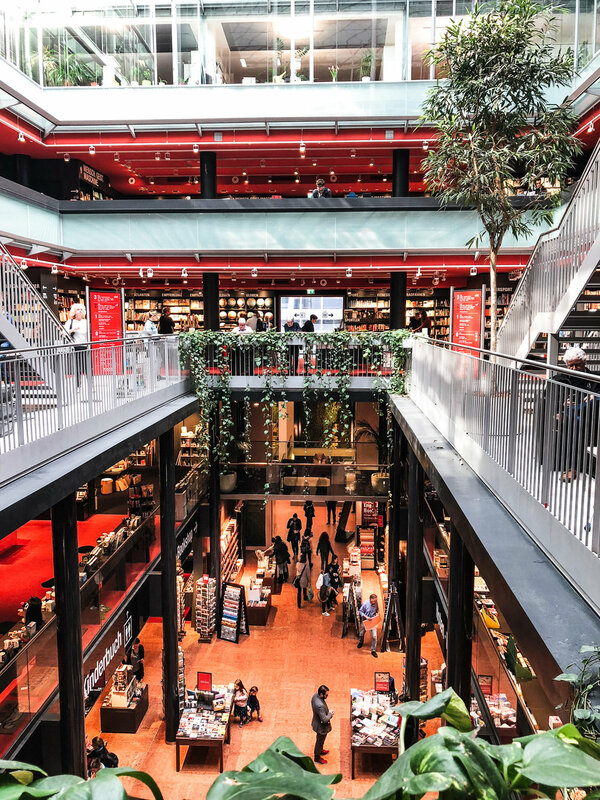 There's so much going on in this city I could have gone to several meet-ups every day if I wanted to but I found a balance by settling for 3 writing meet-ups and one or two others per week. I took a break for a few days after draft 1 was complete and then focused on completing draft 2 and draft 3 by the start of August (about 8 weeks) I underestimated how much work was required in the editing/ rewriting and so I found myself just concentrating on it, excluding other activities during the last 4 weeks. However, I managed to finish draft 3 yesterday and so I'm ready to print 6 copies on my return, to give to my beta-readers in early August. It's been a fantastic project and I've really enjoyed living in Berlin and I'll be coming back next year to write book 3. The book is called The New Frontier and continues the story from The House Always Wins ( but it's not necessary to have read Book 1). There is a main plot and four sub plots all woven together and set in Berlin in the present day and London in the past. 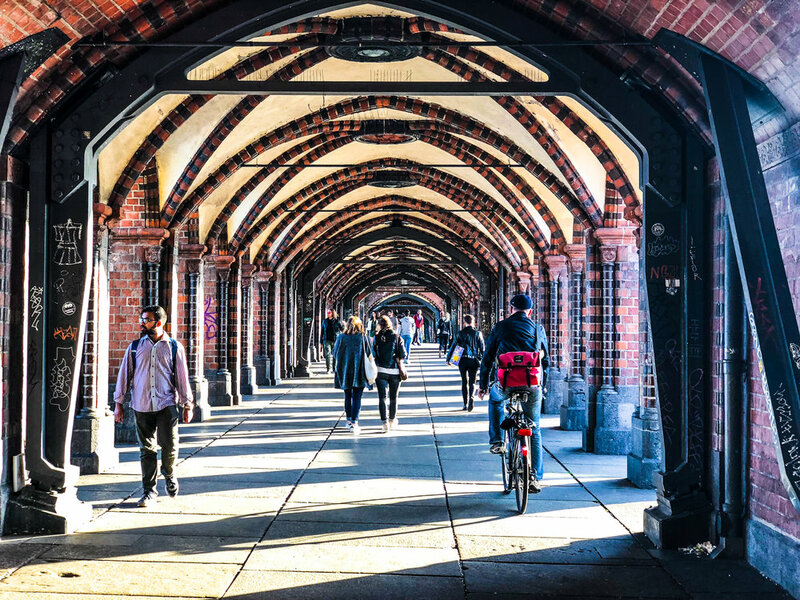 There are thousands of brass cobblestones all over Berlin, and in fact, all over Germany and several other European countries. They are memorials to people who lived in a house close by to the 'stolpersteine' and were sent to a concentration camp. The project started in 1992 and there are now more than 20,000 installed. The one below is from Torstrasse and remembers two people aged 14 and 15 , probably brother and sister. Berlin street art is everywhere. What could be better than a comfortable 30 minute browse in the air conditioned Dussmann English Bookshop at the end of a busy day writing and editing, when it's a scorching 29c outside in Friedrichstrasse? I’ve just finished “Who Rules the World” by Noam Chomsky and this is an excellent book to help understand geopolitics, where the real power in the world is, inconvenient truths, and the decline and fall of the American empire. It covers mostly the power bases in the world from the end of the second world war, when the USA was at it’s strongest point, to the current day where it has been constantly involved in wars and propping up dictatorships to help maintain it’s ever declining power in the western hemisphere. It’s well researched and fascinating read, and discusses among many other things, the two major threats facing the world: potential of nuclear war and the effects climate change. Noam Chomsky doesn’t pull any punches and he has his finger on the pulse of modern politics and explores it in all it’s gory detail. Impressive, thought provoking and highly recommended. I used Adobe Sketch on my iPad to paint this digital still life: Nectarines. Now that I'm taking a break from writing for a week I've started to do some abstract digital drawings. The first one is Sunlight On Grass. Some street photos: Closing the windows in CommonGround restaurant as a sunny day suddenly turns to torrential rain. Five minutes later it was sunny again just like in Ireland. I finished the first draft of my new book "The New Frontier" today. It's the second book in the trilogy, and follows on two years later from where "The House Always Wins" finished. I'm going to take a break now for a week and catch up on painting and photography and a little travel and then when I return to it with fresh eyes, I plan to get Draft 2 and possibly Draft 3 completed in the next 2 months before my return to Ireland in August. I was back in the Gemaldegalerie today and I did drawing of the a Rembrandt painting. Caravaggio, Rembrandt and Vermeer, masters of light and dark. 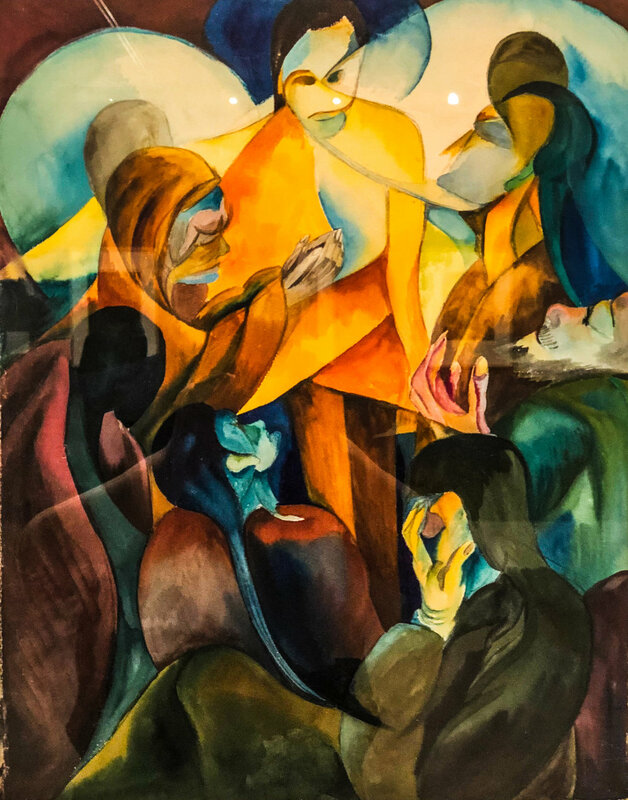 Some of the fantastic paintings on view at the Gemeraldegalerie near Potsdamer Platz. Paul and Trish visited Berlin this week and we did a walk around of the Brandenburg gate, holocaust memorial, Reichtstag, and Unter Den Linden. Lovely weather now in Berlin. A coffee, a slice of history and a side of art - a delicious afternoon.